Isn’t it a hoot to think that as we get ready for bed, owls are just starting their day? 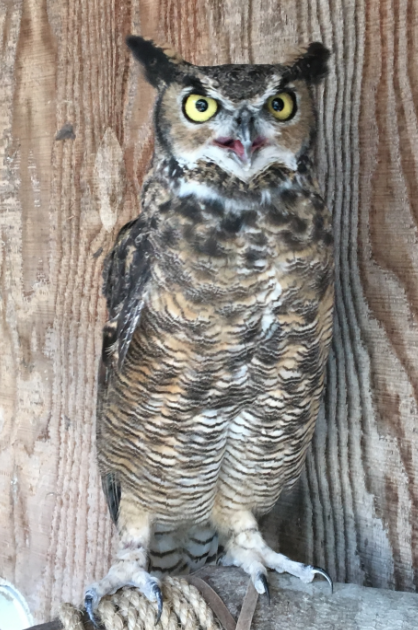 Easily recognizable due to the feather tufts, aka plumicorns, which resemble horns on top of their heads, great horned owls are some of the most common nocturnal creatures found here at the Coastal Institute. Because they are active at night, they have a number of adaptations that allow them to thrive and survive in the dark. Great horned owls' eyes are extremely large and highly adapted for nocturnal hunting. In fact, their eyes are so large that if they were as big as us humans, their eyes would be the size of oranges! And since their eyes take up the majority of space in their heads, that means they have pretty tiny brains. Great horned owls also have the ability to turn their heads almost 270 degrees in each direction, giving them a 360 degree view. This means they can watch their prey at all times without ever making a sound, making them the true ninjas of the night. But their eyes are not the only tools they utilize in a nocturnal setting; their hearing is extremely reliable as well. One crazy adaptation that helps great horned owls to hear is a particular formation of feathers on their face known as a facial disc. This concave formation of facial feathers allows an owl to easily collect and direct sound waves straight to their ears. Owls can even adjust the make up of these feathers, enabling them to focus on sounds from different distances! Great horned owls are ambush predators, which makes speed and stealth key when catching a meal. These guys are covered head to talon in fluffy feathers that enable them to swoop down from their perch without making a sound. Once they have a grip on their prey, it’s game over because it’s estimated a force of almost 30 pounds is needed to break the grip of their talons! They have even earned the nickname “Tiger Owl” due to the insane strength of their talons. Compared to other North American raptors, great horned owls have one of the most diverse diets. Their most common prey items include mice, rabbits, ground squirrels, small birds, and sometimes even a snake. Great horned owls have a pretty incredible digestive system and at times, they even swallow prey whole. Soon after consuming a meal, they will regurgitate pellets that are comprised of the bones, fur, and other parts of their prey they were unable to digest. The coolest thing about these pellets is that you can dissect them in order to discover what that owl had recently eaten! If you have visited us at camp, you have probably met Earl, our very own great horned owl who lives in our nature center and acts as one of our animal ambassadors. Check out this video that we made starring Earl and let us know what you think! To inquire about dates, get more information about the program, or make a booking, contact us directly using the information below or use the first button to request more information. We look forward to hearing from you! Are you looking to bring a school group to our camp? Or are you looking for adult professional development opportunities? Let us know!